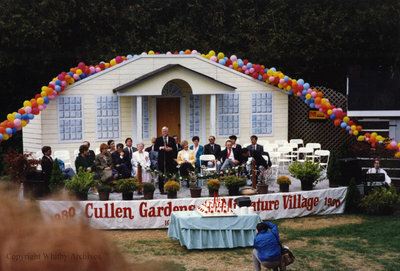 A colour photograph of the 10th anniversary celebration at Cullen Gardens and Miniature Village. In this photograph Mayor Bob Attersley is addressing the crowd. Cullen Gardens 10th Anniversary, May 1990, Photographer Unknown. Whitby Archives A2013_042_109.